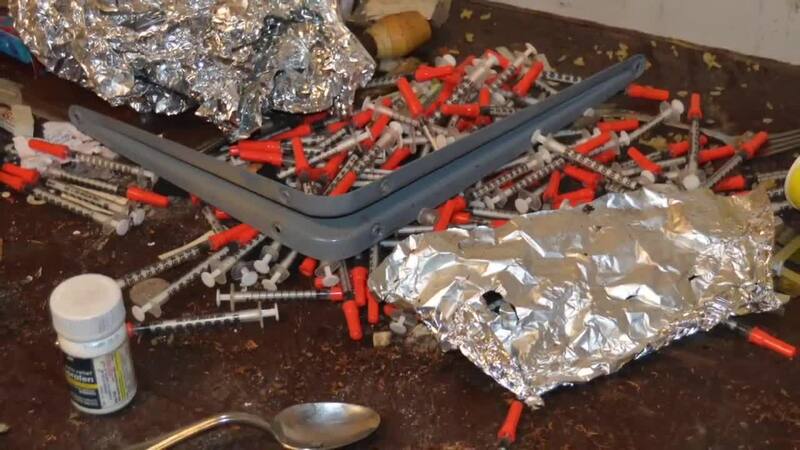 Hundreds, if not thousands, of needles were found at a Lorain home where two men died from an opioid overdose this week, according to the Lorain Police Department. The girlfriend of one of the deceased men said she called her boyfriend's phone and when he didn't answer, she went over to the house because it was one of "his favorite places to visit," the report stated. Police said the house is frequented by drug users. The home appeared to be in deplorable condition, with rotting floors and a broken foundation. The home poses a major health and safety hazard. The conditions of the house pose a risk for authorities who may have to enter the house again if they need to respond to another incident. It’s also a hazard for people who live nearby, police said. Failing said police notified another city department to report the property and its condition. Kellie Glenn, director of the city's Building, Housing and Planning department, said in an email that the only code enforcement violations at that property have been for high grass violations in 2016, 2017 and 2018. She said the house was not on the demolition list and that, while the house has back taxes, that does not mean it is abandoned. Glenn also noted that the homeowner is in a nursing home and that the property also has a delinquent water bill. She said the house has been cited for the roof, porch, garage and broken window as well. If repairs are not made, the case will be sent to housing court. The Lorain Police Department encourages residents to report activity in abandoned buildings and prevent children from playing in and around these houses.